Can anyone answer this question: my M3 has EAP, is automatic emergency braking function "on" by default? I can't find an icon to turn this off and on or adjust its sensitivity according to the latest manual. Is this function only available under autopilot activated or also available in the case of autopilot not activated. Just saw a video which demonstrate that the auto emergency barking saves the car from collision and it is very useful. Thanks! Avoidance Assist on page 86). So, your car does have it, even if you didn't pay for EAP. There's a section on collision avoidance and how it works starting on P87. I saw the video too but the article I read didn't say if AEB was activated or not, they just assumed it was. IS there a source that confirms AEB stopped the car? If so, I am impressed. If you're referring to the video where the M3 avoided getting hit by a red-light running car which hit the vehicle in the neighboring lane, EAP would not be available in that scenario where the car is at the front of the line at a red light. Therefore, no, EAP did not need to be activated. I revisited the video and it's not clear if it was AEB or the driver that stopped the car. AEB is on by default on all Model 3s. It can be turned off but will default to on next time you drive. Doubtful that AEB stopped the car in that video you are referencing. What I'm unclear about is if the sensitivity settings apply to AEB or not. Does anyone know? It appears the car that ran the red light hit something (probably another car stopped at the light) before entering the intersection. The side curtain airbags can be seen in the windows. Maybe - In some frames it looks like the airbags are already deployed but in some frames it doesn't. Elon tweeted yesterday that AEB could not have been activated. 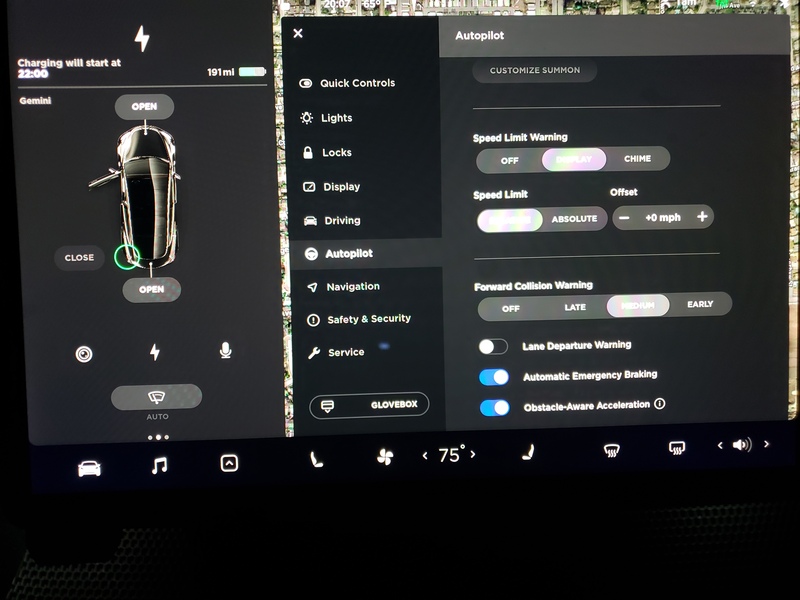 The reason I questioned is that after reading page 86, 87 of the manual, I tried in the car and still couldn't find the control>autopilot>AEB to turn it on and off or adjust its sensitivity from middle to early or late although it does mention it is on by default. Thanks much. Would you please post the link on Elon tweeting that it's not AEB? The sensitivity setting is for the forward collision alert, not for AEB. I've seen the alert several times (usually a false alert), but I've only seen AEB kick in once. One of the things I fear with self driving, or even EAP, or TACC for that matter almost unfolded last night. My wife and I were traveling, a couple of counties away from where we live in Florida. We were approaching the Interstate when we came across 2 large, long handled sledgehammers laying in the roadway. Traveling at about 50 mph, I probably had a second to react to what I can't believe I'm seeing. I was able to quickly steer over one, somehow avoiding the second. I honestly don't know how, but somehow I was able to avoid both! This all makes me think about how I would've fared had I been traveling on EAP at the time. At the least, the one I straddled would have certainly hit my right front wheel. I cannot imagine at that speed the damage that could have occurred to it, not to mention whatever undercarriage and tertiary injury would have been caused. To say the least, this could have caused a pretty serious accident. I know EAP isn't yet finished. It's evolving, and there's a lot of fine tuning to do. I'm sure when its mature it'll be able to detect and even avoid obstacles like this -- much faster and better than I ever could. But experiences like this reveal what can happen for now. On by default but only active over 7 mph according to the manual. My wife just asked me this the other day when we got rerouted around an accident into a subdivision and got stuck in a line of cars. She thought I was going to hit the car in front of me and I told her it will stop itself. Guess I was wrong. Why doesn't it work below 7mph? Guess if I encounter slow traffic it would be worth turning on AP. @jfaubl: I'm guessing it doesn't work below 7mph because (1) you should be able to brake in time at that speed, and (2) stop and go traffic at that speed would probably cause many false collision alerts and unnecessary emergency braking. If you want help in slow traffic then TACC is the way to go (with or without Autosteer).